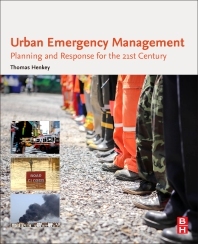 Urban Emergency Management: Planning and Response for the 21st Century takes the concepts and practices of emergency management and places them in the context of the complex challenges faced by the contemporary city. Cities provide unique challenges to emergency managers. The concentrated population and often dense layering of infrastructure can be particularly susceptible to disasters—both natural and human-caused. The book provides guidance across all phases of emergency management, including prevention and all-hazards approaches. Thomas Henkey served for six years as Senior Emergency Management Coordinator for the City of Chicago, where he was responsible for disaster planning and response, as well as special events, physical-security, infrastructure, transportation, and antiterrorism analysis. Mr. Henkey also has nearly 15 years of experience in a range of private-sector and nonprofit safety and security management roles. He is currently the Director of Emergency Management for Titan Security Group. Mr. Henkey is a Certified Emergency Manager (CEM), a Certified Institutional Protection Manager (CIPM II), and a member of the International Association of Emergency Managers, the ASIS Cultural Properties Council, the International Foundation for Cultural Property Protection, the Illinois Security Professionals Association, and the Chicago Council on Global Affairs. He is the vice-chairman of the Chicago Cultural Properties Security Group, and the former chairman of the ASIS International Museum Committee. Mr. Henkey holds undergraduate degrees from St. Louis University, and a Master’s Degree in Emergency and Disaster Management from American Military University.